hey jen renee: Up, Down, All-Around blog tour + Blue Sky Alpacas giveaway! Up, Down, All-Around blog tour + Blue Sky Alpacas giveaway! 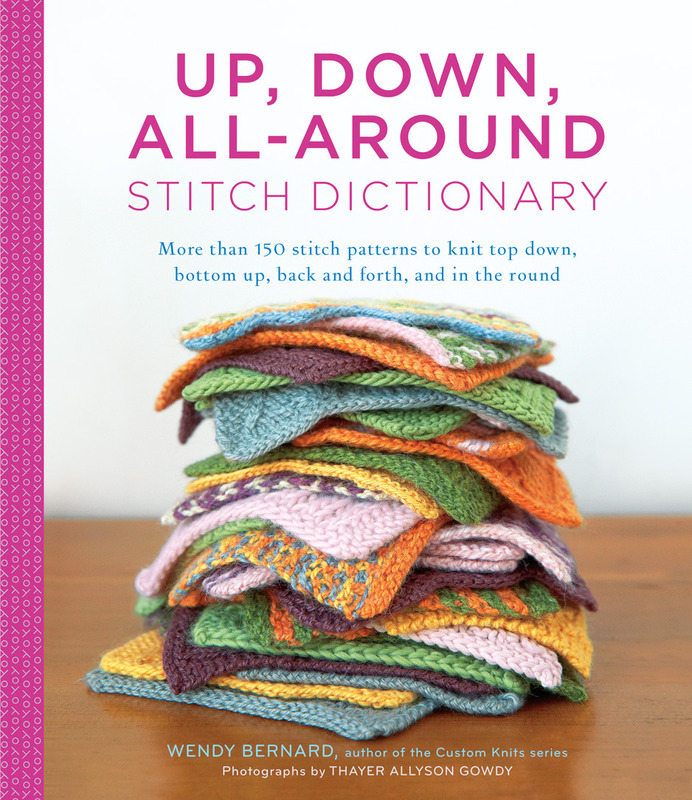 Today marks my stop on an all-star blog tour for a fantastic new stitch dictionary called 'Up, Down, All-Around Stitch Dictionary: More than 150 stitch patterns to knit top down, bottom up, back and forth and in the round.' Blue Sky Alpacas has teamed up with Abrams books, who is publishing this fabulous new resource from best-selling author Wendy Bernard. Read on to find out how you can win a signed copy of the book and a project bag full of yarn from Blue Sky Alpacas! First off, I have to tell you that I own quite a few stitch dictionaries. And none of them are like this book. Wendy has done all the dirty work for you (and me) and this is honestly one of the most useful knitting books I've ever laid eyes on. I chose a herringbone lace rib pattern from the 'Ribs' chapter and wrote up a pattern recipe for a summery cowl using Blue Sky Alpacas Worsted Cotton. Was it hard to do? Not at all! Wendy gives you the number of stitches in each pattern repeat along with how many rounds it will take and boom, you've got everything you need. You don't have to convert it to make it work in the round. It's ready to go! 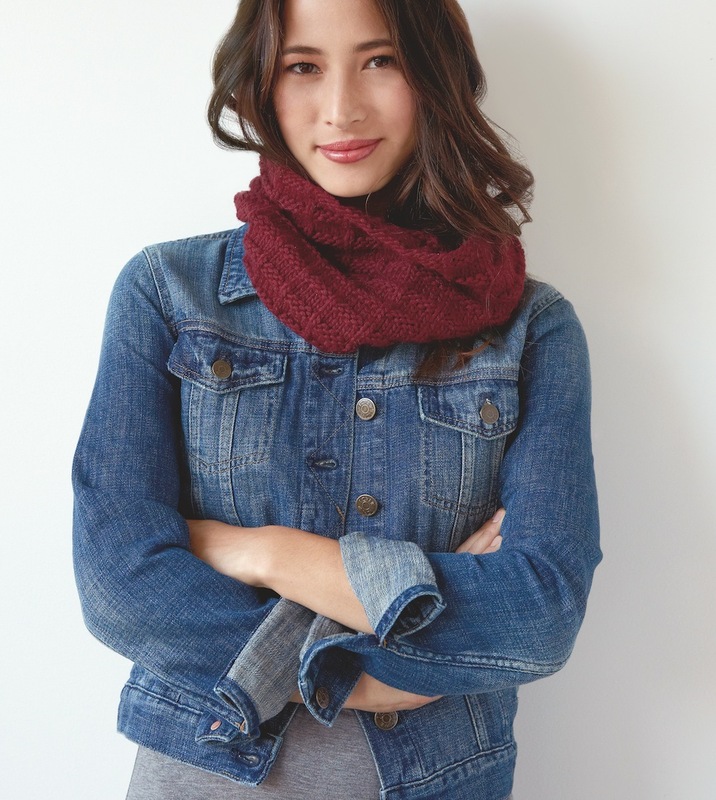 Here's the pattern recipe if you'd like to make this cowl, too. Using US 11 (8mm) circular needles and long tail cast-on, CO 70 sts. Join in the round and PM. Rnd 5: *K1, p1, k1, yo, p2tog, k1, p1; repeat from * to end. Rnd 6: *K1, p2, k2tog, yo, p2; repeat from * to end. Repeat Rnds 5 and 6 until piece measures 9" from the CO edge. BO loosely, break yarn and weave in ends. 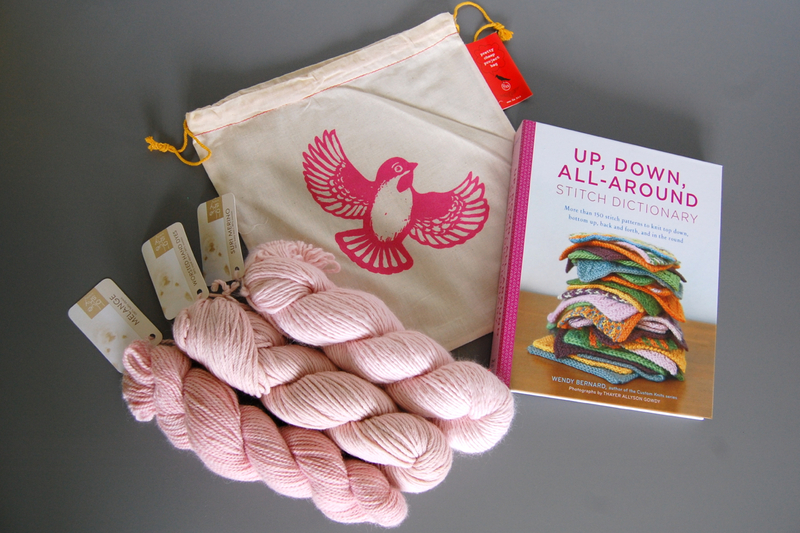 Win the book + 3 hanks of Blue Sky Alpacas yarn + a project bag! Blue Sky Alpacas is going to give one lucky reader a signed copy of Up, Down, All-Around, 3 gorgeous skeins of yarn and a Pretty Cheep Project bag. What a fantastic prize! To enter, just leave a comment below. I will choose a winner at random on Friday, May 30th at 12:00 p.m. CST. Thanks for reading and good luck! Join us for an exciting blog tour full of book giveaways and other good stuff. Also, follow me on Twitter at @KnitTonicWendy for more promotional news, and a tutorial on using Up, Down, All-Around Stitch Dictionary to custom-design your own cowl with any pattern you like! Here's the Up, Down, All-Around Blog Tour schedule, sponsored by Blue Sky Alpacas. Be sure to visit the other blogs on this list for more giveaways and lots of fun projects and customization ideas using this book. What a beautiful giveaway. That book would be a perfect addition to my craft books. I can't wait to get my hands on this book. it looks fantastic!! Anything Blue Sky is ok by me! Their cotton is seriously the best I've ever touched. I actually do not own a stitch dictionary and could use one like this for some new designs. I would love this prize! I have not purchased a stitch dictionary, as I feel most have limited use. This is fabulous! Wow! This book would be perfect for a sweater experiment I'm working on! I love your cowl, will need to make it for next winter. The book looks awesome! If I don't win I'll have to buy it! Just checked, the Des Moines Public Library has a copy of UP, DOWN, ALL-AROUND on order; I just added my name to the reserve list!!! I'd love to add this gem to my personal library. Looking forward to flipping through the pages! This is an awesome giveaway I would love this book. This is awesome! I've just been expanding my skills and would love to have it as a resource! I got a chance to have a quick flip through this book, and it's amazing! You're right: she's done all the hard work in pattern-conversion for us! Thanks for hosting the giveaway. This looks like an awesome book. I've been scared to try my own sweater pattern but with such an awesome stitch dictionary I think it would be much less daunting! Thanks for hosting the giveaway! Thanks for the review. This looks to be an amazing book for any library. I love that it is spiral bound, it makes it so much easier to use! This is an amazing prize, thanks for the chance to win! I would love to win this giveaway! Gorgeous and so very generous! This book is such a neat idea I would love to add to my library!! I really like that is written and charted and that it's easy to either knit flat or in the round. Oh my gosh...I would love this book! What an amazing reference and inspiration!! So many options! This would be an awesome addition to my personal library! I love Wendy's books! Thank you for the chance to win one. This looks like a fabulous book! This book is a wonderful concept! Thank you for a lovely giveaway. I don't own any stitch dictionaries and would love for this one to be my first. Your cowl is so gorgeous. 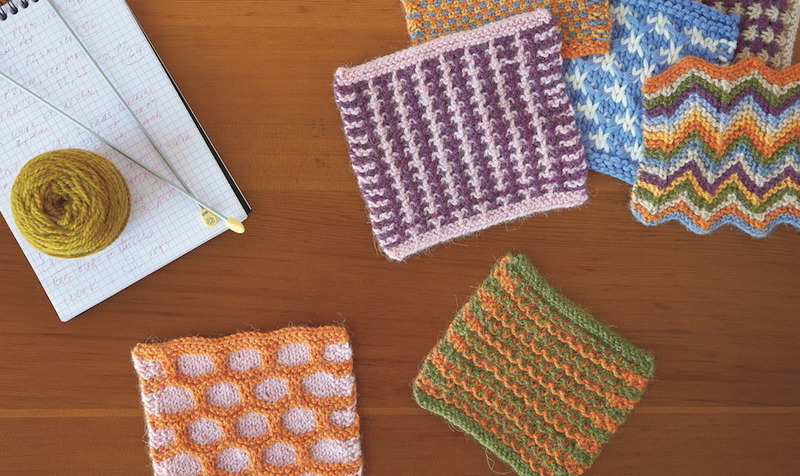 This is an amazing resource - I just love that the stitch patterns can be knit flat or in the round! That looks like a great book. I love Wendy's books. The yarn and project bag sweeten the deal! Gorgeous cowl! And this stitch dictionary looks like a perfect resource. I always love Wendy Bernard's books, designs, explanations. Thanks for the giveaway! That book looks like it will be the perfect resource for me, especially since I prefer to knit in the round. 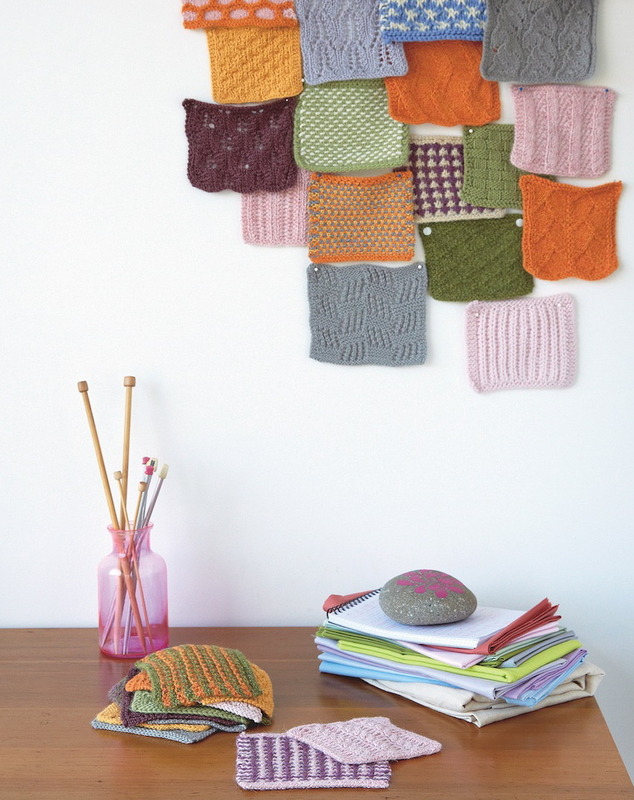 I'm still a fairly new knitter and this looks like an amazing resource! Thanks so much for the opportunity to win, and for sharing the free pattern. MarieInNYC on Ravelry. The book looks great; would love to add it to my collection of Wendy's books! I love this yarn and adore the color! Thanks for the giveaway. What a gorgeous book. I'd love to win. What a great looking book! Would love to add it to my library. Wow, that looks like a great book! Love Wendy's books and BSA!! This book looks so handy! I haven't tried modifying patterns with new stitches yet but am ready to start! Love the pattern! Thanks for the chance to win! I'm going to start my cowl tonight! Can't wait for the book and some beautiful yarn!!! What a wonderful photo! I want to pick up that yarn and start knitting right now! Oooooh! I love this giveaway! I'm intrigued by this book! I hope I win! Oohh... what a great yarn! The book looks like it's longing to join my library! Gorgeous giveaway - my fingers are crossed! Wow! Very nice giveaway. Thanks for the review, even if I don't get the prize would get the book for my library. This looks like a great new book to add to my knitting library! This looks like a really great addition to any knitting book collection. That looks like a great book! I'd love that gift! This is an awesome giveaway and love the pattern. I hope to win. Yes! I need this book! What a great giveaway! Thank you! Sounds like an amazing book! And what beautiful yarn. Would love to win this fabulous book! I love to study the etymology of words so I am pretty sure I would love to read about stitches. Just getting back into knitting after many years of not creating with yarns and needles. Need to build up my reference collection. I might even venture into designing as I learn new stitches. This sounds like the best stitchionary every. I'd love to have this in my library for hours of design possibilities. Looks like a super-useful stitch dictionary and some gorgeous yarn! Thanks for the opportunity! I never get to crochet anymore, and don't know how to do much knitting, but my sweet daughter in law is an avid knitter and she would love this prize. Looks like a great book and what yummy yarn! Thanks for a great giveaway. This book really looks as thought it would come in handy. Thanks for the chance to win! Thank you for this giveaway. I would love to knit with their yarn and what a huge help it would be to have such great book! I don't yet own a stitch dictionary and this is one I am keen to have. Thanks for the offer! Oh I want this!! The yarn is lovely and the book would be lovely! This book sounds beyond amazing! No matter how hard I try, I just don't "get" charts. So I love that the steps are written out too! WOW.....GREAT giveaway! Thanks for sharing! 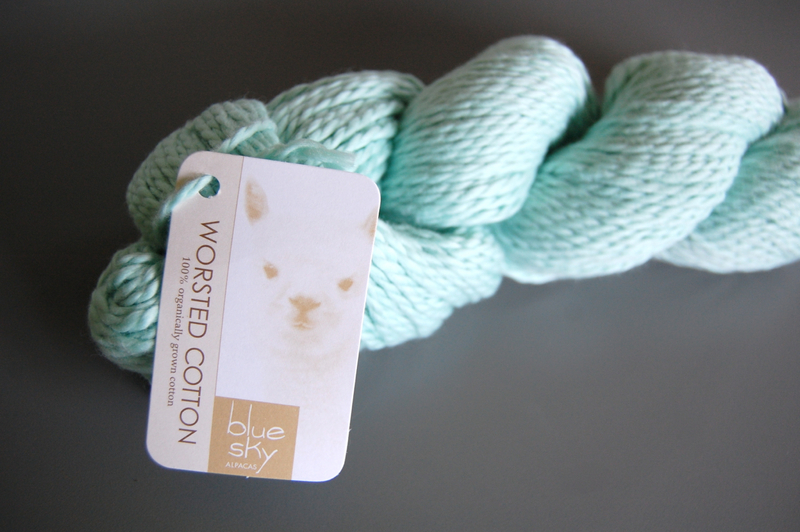 I love the blue sky yarn! and this book looks amazing. My sister got me back into knitting recently and I need a new project/inspiration! I loooove this book. I have tried to do conversions myself, but I love that she did the dirty work. SQUEEEEE! That pink tho! I'm obsessed with any and all shades of pink this summer. Absolutely obsessed with Blue Sky AND that book looks incredible. That pattern too! Making it!! Wow - this is a fantastic giveaway! I would get lots of use out of that book...and the yarn looks superb! Love the idea of this book--converting to an in the round pattern is more math than I have, so this will be awesome! Thanks for the opportunity to win the give away! Ok...this book is on my "must get" list!!! It would be a disaster if I had to try and convert any of these patterns myself! Ha! Flat AND in the round?? omg need. Also that yarn is scrumptious! Keeping my fingers crossed.. this would go perfectly on my bookshelf! The idea for this book is genius! I'd love to win! I love your beautiful blue yarn that your chose. Such a delightful color. I love working with yarn. this is so amazing. thank you for offering this Jen! The book is literally the best idea ever. One of my knitting groups was just discussing this book. It sounds like a great resource to have. Awesome book and great design. I like your cowl; I'm quite the fan of herringbone. Love this idea for a book, sign me up for the drawing! I love the idea of this book! Super helpful for designing from the top down. I have been dying for this book since I have seen it floating around on instagram! Its so neat, I love stitch dictionaries! This book is genius! Thanks for the review! urbanizer on Ravelry. I would love the book AND the yarn! I am mdesenfants on Ravelry. This looks like the most perfect book! I love stitch dictionaries, but it's always such a pain to try to convert to in-the-round - thank you Wendy for doing the hard work for us! I'd love to win; AmandaLynA on Ravelry. This book looks amazing, I would love to win it! If I don't I will for sure be purchasing it!! This book is stunning in every way! Thanks for your review of it! I have a lot of stitch dictionaries, but none that look quite this useful. I can't wait to have a look at this one! What a great giveaway! Please enter me to win! marvelous book! 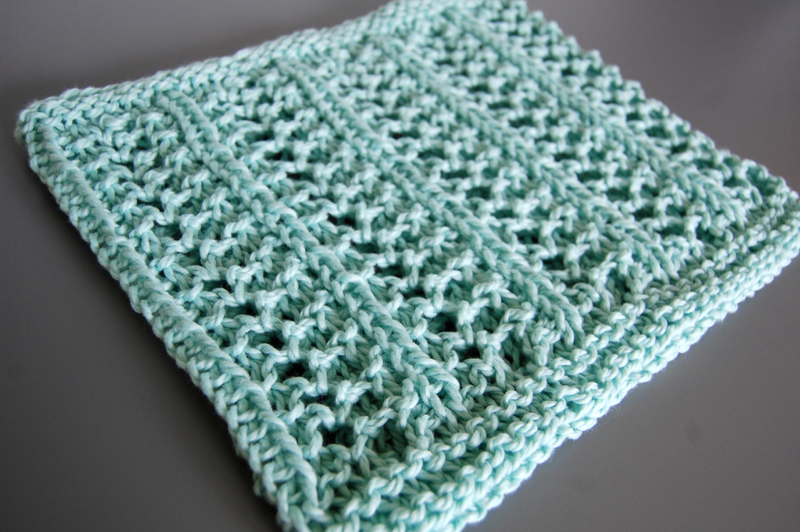 love working up new stitch patterns as dishcloths just for practice ... love the look of all those worked up pieces. thanx for the chance to win this and the yarn. Would love to win this stitch dictionary. They are great references! Thanks for a chance! Looks like a very useful and lovely book. Thanks for the contest. This would really save me the trouble of trying to convert stitch patterns to the way I want to knit my stuff! Lovely giveaway! ooo love blue sky! thanks for offering the giveaway! Wow, this book looks like a great reference. Just found your blog, and it's delightful! I love to use stitch dictionaries when knitting afghan squares for charity and when knitting dishcloths. I can't wait to check out this stitch dictionary. I love her new spin on an old idea and all of the work that went into it! I can’t wait to check out this book! So many beautiful stitch patterns sure to inspire!!! The book sounds amazing, Jen, and the yarn is gorgeous! Thanks so much for such a fun giveaway! Hope you have a great weekend! This book looks wonderful - a great reference for a beginner like me! thanks! What a wonderful book! Top down, AND in the round? Sweet!